Crystal Palace goalkeeper Wayne Hennessey will face no punishment for an alleged Nazi salute after a Football Association charge was found not proven by an independent regulatory commission. Hennessey was pictured with his right arm in the air in a photo posted on Instagram by German team-mate Max Meyer after the FA Cup win over Grimsby. The 32-year-old had denied the charge. 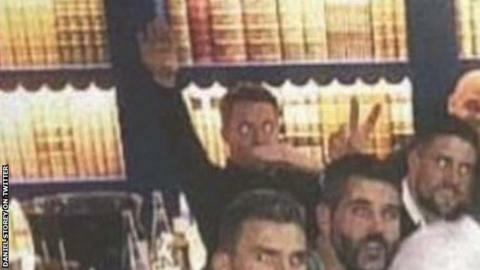 He said any resemblance to the Nazi gesture was "absolutely coincidental". The Wales international has previously said he "waved and shouted at the person taking the picture to get on with it" and "put my hand over my mouth to make the sound carry". "This was a genuinely innocent moment, which appeared to be something completely different when captured on camera," he said following the FA's decision on Friday. "I want to state for the record that I abhor all forms of racism, fascism, anti-Semitism or discrimination of any kind," he added. Palace manager Roy Hodgson said: "I believe Wayne and his people were there eight hours yesterday putting their case forward. I'm very happy with the outcome because I always believed him to be innocent." The FA had alleged the action breached its rules relating to abusive, insulting or improper conduct and bringing the game into disrepute. The governing body had also said it constituted an 'aggravated breach' because it included reference to ethnic origin, race, religion or belief.